Sapphire release the Radeon HD 7970 based graphic card with factory overclocked feature and dual fan cooling system and dual-BIOS physical switch option allows you to select between a higher performance setting of 1GHz for the core and 5800MHz for the memory and a normal speed, its the Sapphire Radeon HD 7970 OC Dual-X. The SAPPHIRE HD 7970 OC Edition features SAPPHIRE’s new dual-extractor technology - Dual-X - a highly efficient multi-heatpipe cooler with dual fans providing quiet and very cool operation during normal operating conditions, and superb cooling performance even under extreme load. 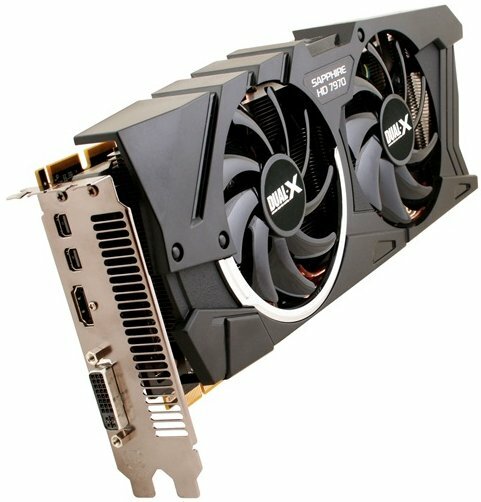 The HD 7970 from AMD is the most powerful single chip GPU ever built - it has a new internal structure with 32 compute units and a total of 2048 Stream processors. The SAPPHIRE HD 7970 OC Edition ships with a raised core clock speed of 950MHz, and 1425MHz for the memory. Its Dual BIOS switch allows users to select the higher performance settings of 1GHz core and 1450MHz memory, making the fastest card in its class. This setting also uses a more aggressive fan profile and raises the limits for maximum overclocking. For enthusiasts wishing to maximise performance, a new version of the SAPPHIRE overclocking tool, TriXX is available free to download from the SAPPHIRE website. TriXX allows tuning of GPU voltage as well as core and memory clocks, whilst continuously displaying temperature. Manual control of fan speed is supported, as well as user created fan profiles and the ability to save up to four different performance settings. The retail bundle for the SAPPHIRE HD 7970 OC is second to none. In addition to the standard bundle consisting of an Active mini-DP to single-link DVI adaptor for Eyefinity setup, CrossFire bridge cable, HDMI to DVI adaptor for dual DVI setup, DVI to VGA adaptor, 8 pin to 4 pin power adaptor and 6 pin to 4 pin power adaptor, SAPPHIRE also provides an extra mini-DP to DP adaptor and a 1.8 metre HDMI 1.4a cable.